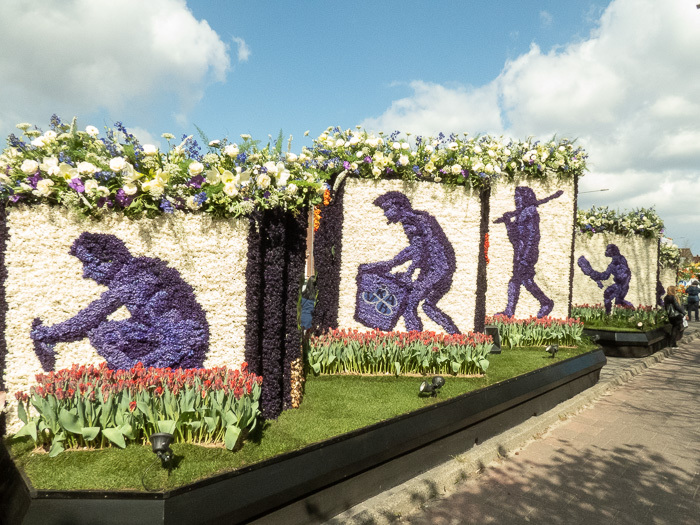 Overwhelming flower arrangements made with craftsmanship and love in beautiful color combinations on the yearly flower parade in April. In Sassenheim near the Keukenhof. Just 20 minutes by train from Amsterdam. 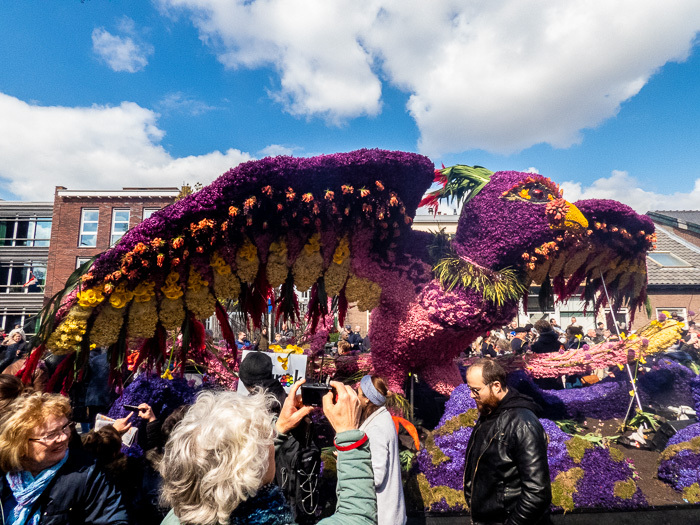 But: where to see the flower amongst the flock of flower floats in parades in Holland? I will tell you! Rich assortments of bulb flowers. Striking special types of daffodils. Dazzling floral arrangements emphasize the rhythmic course of color groups. But I also see unions, patatos and bare flower bulbs arranged in expressive patterns. The float with the Fenix is definitely the flower of the flock. Also in Holland we have easy going proverbs, you know. In case of a communication breakdown we “say it with flowers”. So, ee say it with flowers when words fall short. 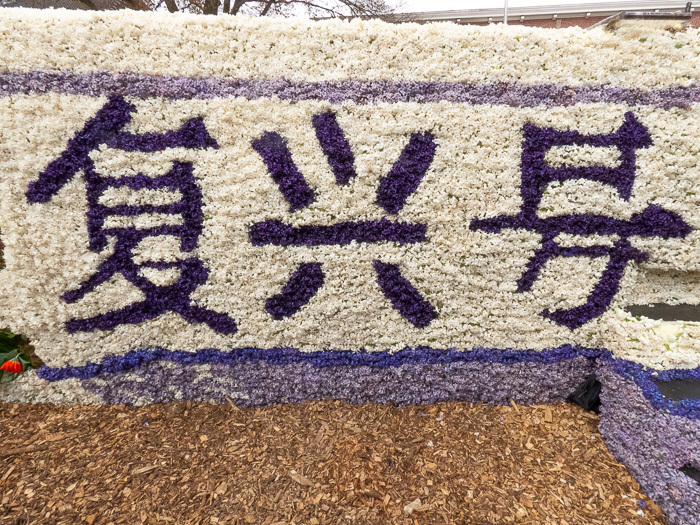 On todays parade flowers are speaking loud and clear. Flowers are grouped in expressive forms and their binding is highly professional. Along with the Fenix I see Ducks, a Toekan and Gods of the Hindus fitting perfectly in the themes of their faults. Ravishing beauty and down to earth design intermingle in the parade. Statues of horses build up carefully with thousands of flower bulbs seem to be pulled out of the clay. An organic processing of branches can be the basis of the flower arrangements. Culminating in combinations of green material, flowers and plants in harmonious structures. 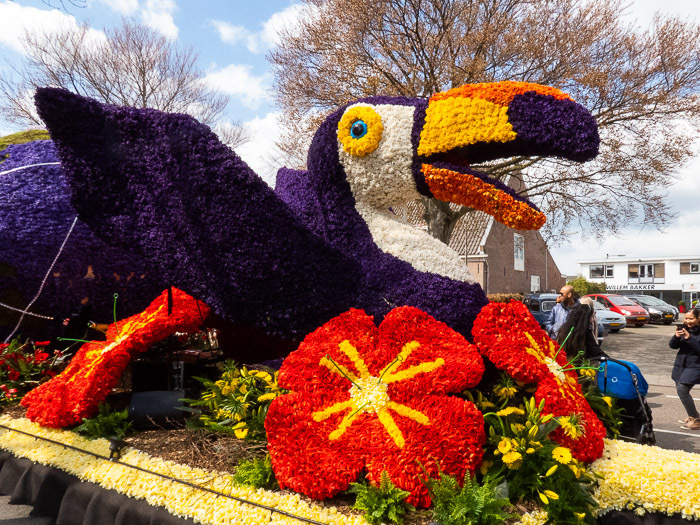 The flower parade covers a route of approximately 25 km kilometers. The yearly parade in mid April usually starts in Noordwijk at 9 a.m. and ends in Haarlem at 10 p.m. In between it passes villages and towns: Voorhout, Sassenheim, Lisse, Hillegom, Bennebroek en Heemstede. A lot of roads are closed for traffic. So going to the Parade by car is tricky. By car: Sassenheim is a fine little town to see the flower parade pass. I parked my car at the edge of town and walked to city center to see the parade. The flower parade might stop here for lunch. By train: is a very good choice. Take a bike with you on the train. By Bike: it is really nice to visit the flower parade by bike. Before or after the parade you follow one of the many well indicated bike routes through the bulb fields. Zundert: Yearly event in the end of August or the beginning of September. 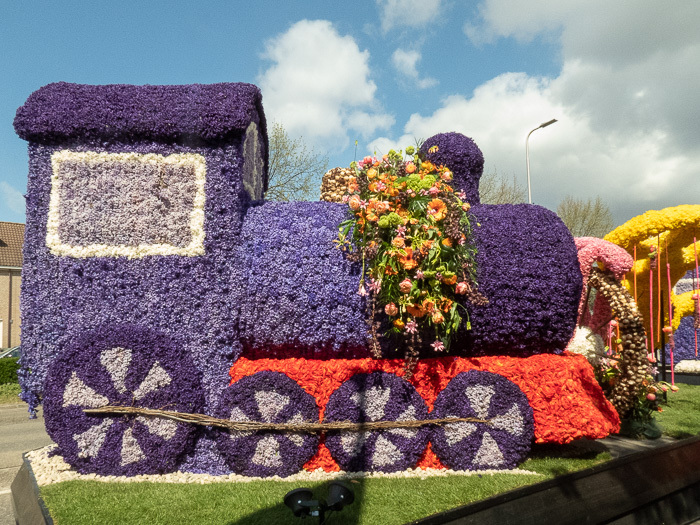 The flower parade of Zundert is the largest parade in the world. It is purely voluntary work. Twenty neighborhoods compete with each other to build the most beautiful vault. This tradition goes back more than eighty years. Sint Jansklooster: Yearly in the middle of august. The flower parade of Sint Jansklooster is one of the top three in the Netherlands. The flower spectacle has grown into a well-attended and highly valued nightlife event. Vollenhove: Yearly event starting in the middle of august. 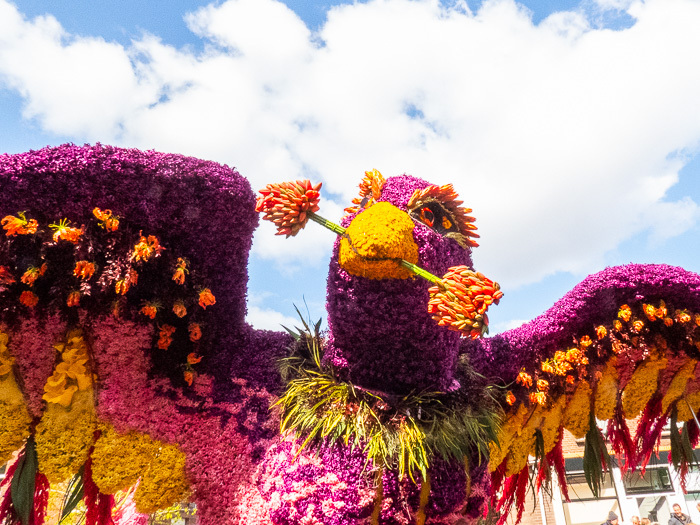 The flower parade is the conclusion of a corso festival, which lasts almost a week. 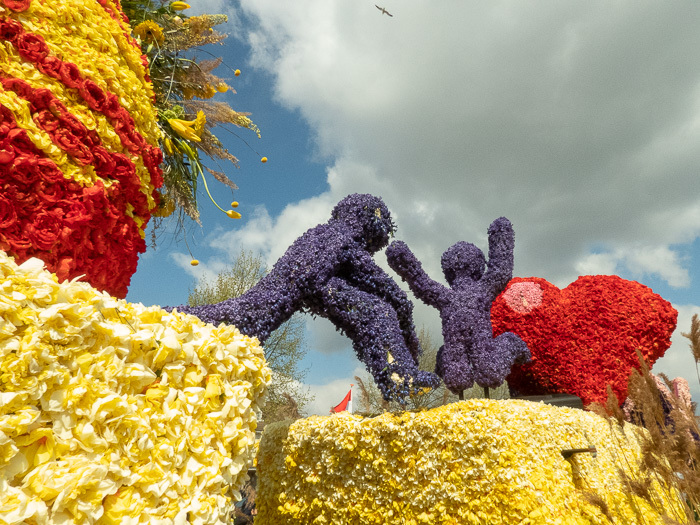 Millions of Dahlias adorn 12 floats during the parade. Leersum: Yearly event on the third Saturday of August. 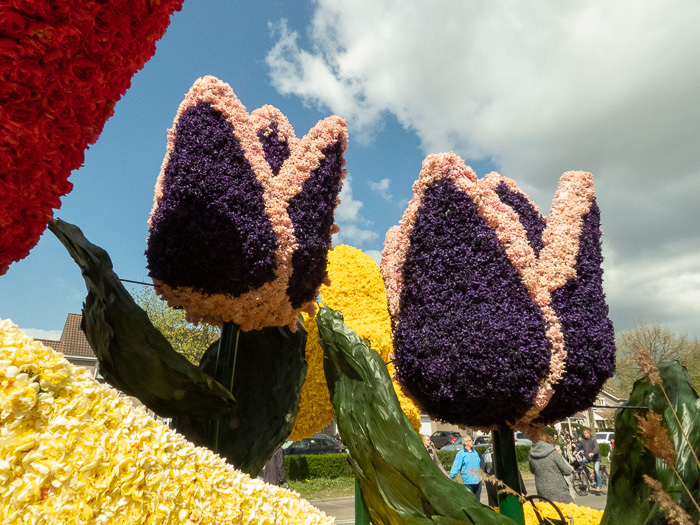 The flower parade Leersum is the most colorful and largest event of the Municipality. Around The Hague: A yearly three day event in the first week of August. 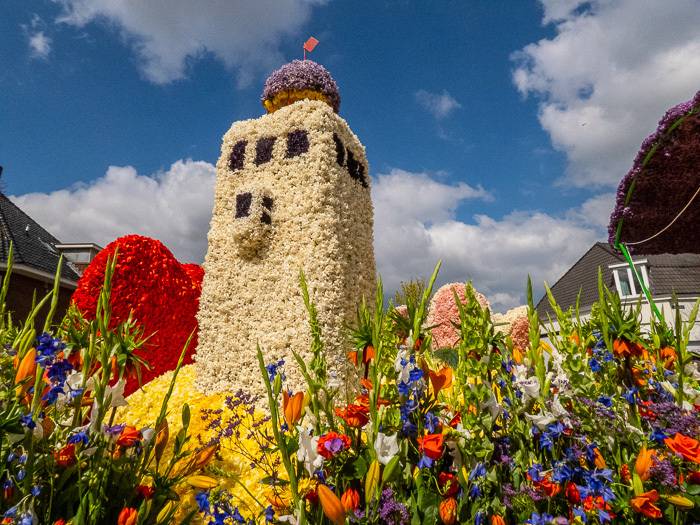 The sailing Flower Parade sails through The Westland and to the cities of Schipluiden, Maassluis, The Hague, Delft and Vlaardingen among others.